Sukkot comes on the heels of Rosh Hashanah and Yom Kippur but it is a very different type of holiday. It is one of our busiest, most exciting, most enriching and most expensive weeks of the year at Shabbos House! The holiday breaks up into two days of holiday in the beginning and two days of holiday at the end, book-ending four days of semi-holiday (weekdays that are Sukkot) in between. This year the holidays fall Sunday night thru Tuesday, plus the Shabbat in the middle. Here’s the schedule for Sukkot 2018 at Shabbos House (all Sukkot holiday events are at Shabbos House). Come when you can, as much as you can. This is a formative, blossoming, really good time of year in our campus community. You can also view our 2018 holiday at-a-glance calendar by clicking here for the printable PDF. This first night is “Spice Night in the Sukkah” – menu includes: Everything Spice on the Challah, Spice-Roasted Chickpeas, Garlic-Crouton Caesar Salad, Curry Butternut Squash Soup, Oregano & Basil Meatballs and Spaghetti, Garlic Green-Beans, Nutmeg Cinnamon Apple Pies. The first Sukkot lunch has a “Sweet and Sour” theme. We’re serving Sweet & Sour Salmon, Diced Seasoned Sweet Potatoes, Lemonade, Sushi with Sweet Sauce and Sriracha Sauce, Apple Crumb Cake. The second night in the Sukkah is our Israeli night – co-sponsored by Great Danes for Israel. Menu includes Pita, Hummus, Tehina, Babaganoush, a Zaatar dip, Potato Bourekas, Israeli Salad, Shwarma-seasoned Chicken, Couscous, and Rugelach for dessert. 9/25: Tuesday day – Second Day of Sukkot. Prayers 9:30am, Lulav & Etrog Shakes, Lunch at 12:30pm and on. Spanish in the Sukkah theme: Salsa-Taco Salad, Guac, Gazpacho, Beef Empinadas, Spanish Rice, a Spanish Dessert and a Sangria drink. 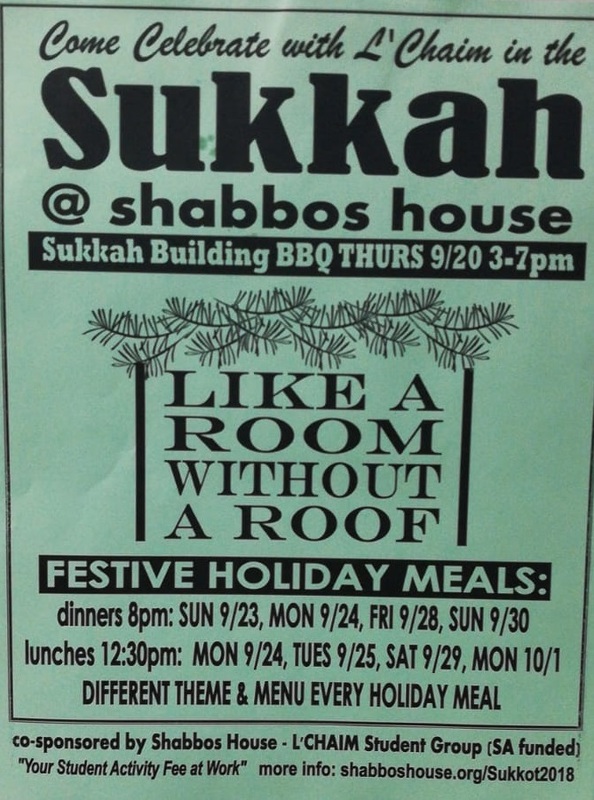 9/28: Friday Night, Shabbat Dinner the Sukkah! this is usually when our Sukkah is at its fullest! Cider in the Sukkah, Sukkahleh Song, etc… Prayers 7pm, Dinner 8pm, it’s also our daughter Esther Miriam’s 7th birthday. Friday starts off wet, but Friday Night should be dry and crisp out. Nice 50’s chill to bring out our inner Sukkah warmth! 9/29: Shabbat Day – Prayers 10am, No Lulav on Shabbat, but Torah reading etc as usual. Shabbat Lunch in the Sukkah 12:30pm. We may try to get lunch started earlier as some may be headed to this year’s “Clash” on campus, but will be here afterwards for lunch for those coming over afterwards. 9/29: Musical Night in the Sukkah with the local Golfstrom Band, for both community and students. This event begins 8:45pm and is in memory of (Mendel’s sister) Esty (Rubin) Cohen whose yartzeit is just after Sukkot and Simchat Torah ends. It’s casual and informal, not a concert. Come and go as needed. SECOND DAYS OF HOLIDAY AND SIMCHAT TORAH – HOLIDAY FINALE! 10/1: Monday Day – Shmini Atzeret prayers 9:30am, last lunch in the Sukkah 12:30pm. 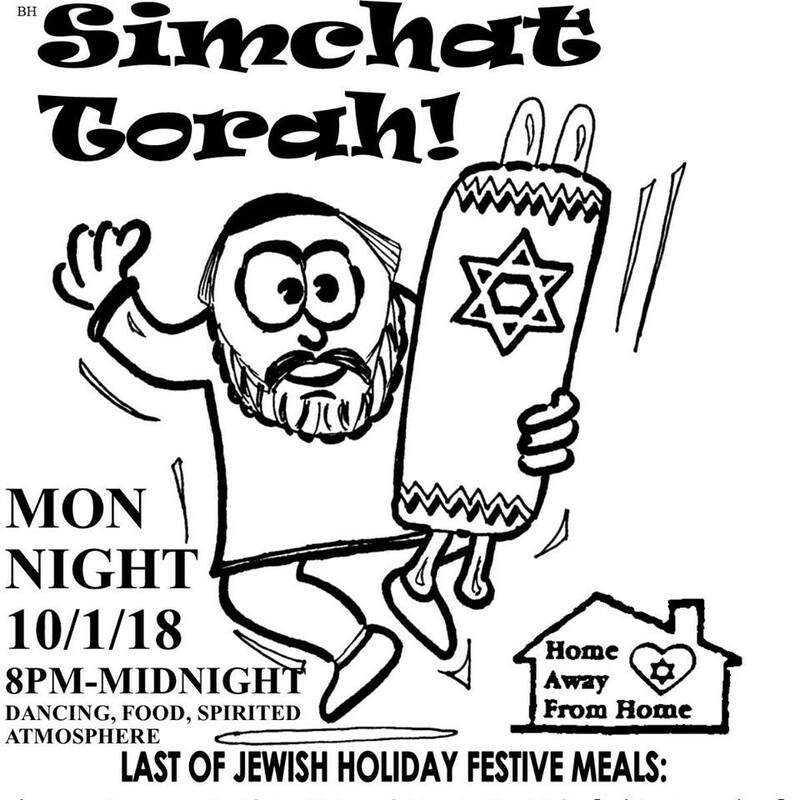 10/1: Monday night – Simchat Torah Celebration and Dancing! One unique night every year, dancing, celebration, big all night dinner buffet, 8pm to Midnight! A Jewish soul needs a little dancing, uplift on Simchat Torah, even coming for a half-hour should do the trick.